As the owner of four of the most highly reviewed event venues in Connecticut, Elegant Banquets prides itself in its elegant suburban facilities that create unforgettable events. 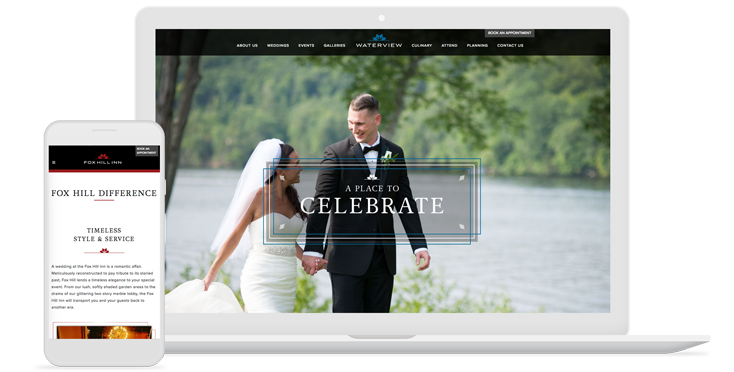 Our agency partnered with Elegant Banquets to assist with their venue marketing needs and create websites and print collateral for all 5 of their event venues. Each venue saw an increase in leads of up to 1500%. Since the launch of the five websites, Elegant Banquets have witnessed an influx of leads and conversions via the contact forms Mediaboom has implemented throughout the sites. Elegant Banquests has acknowledged an average of fifteen leads per day across each of the venues which is above and beyond their daily goal. We are perceiving a steady growth of new business for years to come. Elegant Banquets was launched in 1986 by John Royce and Tom Montague, two business partners with 35 years of experience in international business. As world travelers, they had the opportunity to visit some of the most beautiful restaurants and hotels in cities around the world. Inspired by their experiences, the partners embarked on a new mission: to bring elements from these extraordinary venues – great food, beautiful settings, gracious staff – back to their home state of Connecticut. Today, Elegant Banquets operates five well-established event venues, each with their own distinct and sophisticated design: Fox Hill Inn (opened in 1986), Candlewood Inn (opened in 1999), Waterview (opened in 2004), Riverview (opened in 2008), and Le Chateau (opened in 2017). Elegant Banquets needed assistance with their venue marketing strategies and approached Mediaboom with a unique challenge: to redesign the logos and websites of their five venues, giving each venue its own individual style while also modernizing and uniting the brand as a whole. In addition, the client wanted the logos and websites to stand out from their competitors and not feel too feminine – a style very often found in the wedding venue industry. Although weddings are the most popular events hosted at these venues, the client wanted the logo to appeal to other potential clients as well, such as corporate events, bar/bat mitzvah’s, proms, and other social gatherings. The conceptual design phase consisted of multiple logo explorations: from literal details of each venue’s unique windows and landmarks to more abstract shapes and graphics that communicated quality and professionalism – the two main traits the company wanted to convey through their brand. In addition to communicating these qualities, RM Events was looking for a logo that consisted of both mark and text, where the mark could potentially stand alone as a graphic element. Mediaboom created a system for the logos whereby each venue had its own unique color and name, but the logo mark itself was the same throughout all venues, uniting the brand as a whole. The neutral style of the mark and text makes the logo stand out from the more feminine styled branding of its competitors. The four diamonds in the logo mark represent the four original venues, united as one brand, while the abstract diamond itself alludes to marriage and weddings, the most common event held at these venues. The logos stand alone while also systematically working as a set, and the logo itself communicates professionalism and sophistication without being too wedding specific. The next step in the design process was to finalize typefaces for use on the websites. The design team was tasked with determining a headline and body copy font pairing that complimented the logo type while also contrasting each other to put emphasis on the headlines. The design team determined the serif typeface Adriane Text was the best solution for the headline due to its elegant and evenly balanced style. The sans serif font Proxima Nova was chosen for the body text because of its friendly and clean nature, contrasting Adriane Text while also complimenting the logo type. The Mediaboom design team was tasked with the unique challenge of designing a single website layout that could be applied across five different and unique event venue websites. By designing one layout, the goal was to be able to only change out imagery, colors, and text in order to generate the other three websites. The final layout put an emphasis on showcasing professional photography with a clean, bright, and airy background. The logo mark was used as a graphic element, and the final design was applied across all four venue websites, allowing them to stand apart from each other through photography and text, while also being united through form and function. Each page suggests other related pages in the site to keep a fluid user experience and make it easy for the user to find helpful information. Subtle parallax animations were also included in the websites to peak the user’s interest and add sophistication to the design. Mediaboom developed a virtual tour as part of the website, to allow users to explore the unique venues online. The virtual tour takes visitors on a journey through each venue and gives a them a more accurate idea of what the space is actually like in person. The live social feeds integrated into each of the webistes displays the latest activity and social buzz surrounding each of the venues. Users can get a behind the scenes look at the latest events, find inspiration and ideas, and share photos with their friends and family.